Perspective in Action Review – AiPT! Having just reviewed a book on manga art, why not dive into something a little more technical? 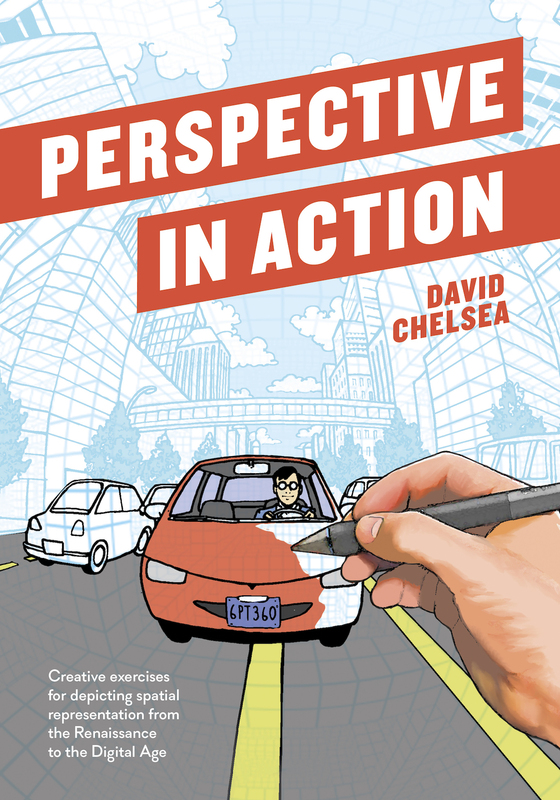 David Chelsea–creator of a few graphic novels with a unique style that sets him apart from many others–writes and draws this book on perspective in a graphic novel style. I wanted to review this as I’ve always been curious about art and understanding how it works would bring more appreciation to the many comics we enjoy every week. Perspective is a fundamental element in the development of art and for understanding spatial relationships, but it is an underserved topic in the world of art instruction. Author and artist David Chelsea takes readers through the major perspective-related developments in history, teaching them how to re-create these same experiments by leading artists in all fields (including drawing, painting, and sculpture). 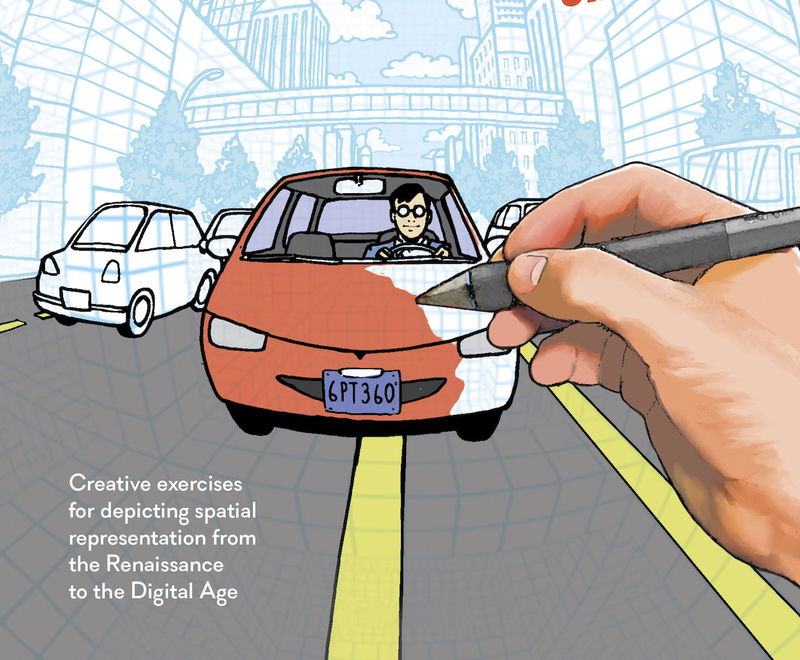 Covering a wide-range of mediums (pen and ink, paint, chalk, digital art, woodwork, and more), Perspective in Action gives readers a more hands-on approach to perspective, as opposed to the usual theoretical presentations found in other books. This book isn’t just about regular old perspective (though that does make an appearance) but also goes into other types of perspective including some fun ways to practice them. That includes art similar to Escher, 3D effects, and more. Hell, it even goes into how to draw perspective using a mirror (which was made into a documentary) and other alternative ways of drawing. There’s a good use of mixed media in this book. I may not be an artist myself, but Chelsea writes this book in such a clear and well-organized way I can’t help but try. Broken down into seven chapters, Chelsea starts with the basics and shows how weird perspective can get as you progress through the book. Told via conventional comic book layouts, Chelsea draws from the artist’s perspective through much of this book which includes seeing the hands of the artist draw. It’s a neat way to teach as it mimics how you see the page in the first person. It also makes the book feel personal as if you’re living vicariously through Chelsea, but also seeing a future version of yourself drawing as the images suggest. The chapters include all sorts of tricks to draw in different types of perspective–six point perspective was one of my favorites, as it requires you create a paper globe–that are easy to understand and follow. There are some clever and creative ideas throughout too, including Chelsea inserting a tiny artist who explores on the page and some interesting uses of photography intermixed with his art. There’s also a running joke of sorts of an artist taking breaks as a reminder to not go hard at drawing for too long. Each chapter opens with a single page of prose that helps set up the concepts within as well. The first person POV adds a layer to the experience. The art in the book is quite good and it’s always enjoyable to see the first person point of view amongst the dazzling perspective drawings within the drawings. It’s so easy to think of something like perspective and get bored or oversimplify it in your mind so you’d rather not bother, but Chelsea makes it fun. The imagination involved in pulling these highly technical concepts and drawings into a visually stimulating book is the epitome of good teaching. I really don’t know how this could be any better unless it came with paper and pencils. Through some well-drawn pages and easy to understand directions, Chelsea will draw you into the fantastic world of perspective and make it so much fun while you read about it. I can’t say that I draw, but after reading this I not only want to give these tricks a whirl, I might just enjoy it that much more. Artist or not, you'll enjoy Chelsea's art and easy to follow directions.